The human body is a marvelous system of complex structures and processes that work in harmony to sustain and protect a living, active person. Many disabilities that affect certain functions of the body upset the balance which preserves a person's health and well-being. Loss of feeling leads to burns and injuries. Lack of pain in injured parts results in neglect and infection. In time, the bone gets infected, and fingers or the hand can be lost. Consider pain. The ability to feel pain is an important protective mechanism of the body. In disabilities where the sense of feeling and pain is reduced or lost in parts of the body - such as leprosy, spinal cord injury, spina bifida, or advanced diabetes - minor injuries happen more easily, and they run a risk of becoming major or life-threatening problems. 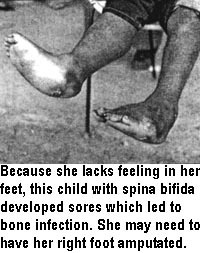 Children with spina bifida, who often have no feeling in their feet, also can develop sores and bone infections similar to those seen with leprosy. Jesús, whom you meet in Chapters 16, 26, and 45, lost a leg from such a problem, and also had severe pressure sores on his backside. Pressure sores and urinary infections are common and often life-threatening problems in persons with spina bifida and spinal cord injury. Two chapters in Part 3 (Chapters 27 and 28) look at innovative ways of protecting against and treating pressure sores. Chapters 25 and 26 look at techniques for avoiding and combating urinary infections. Persons who are quadriplegic (spinal-cord injured in the neck) usually have hands paralyzed as well as legs. In Chapter 24, a young man tells how he made his own device to hold a pen. In Chapter 28, a youth learns to use spasticity to dress. Persons with uncontrolled movements or limited control of their hands (or whole bodies) often have trouble with carrying things, especially liquid food and drink. 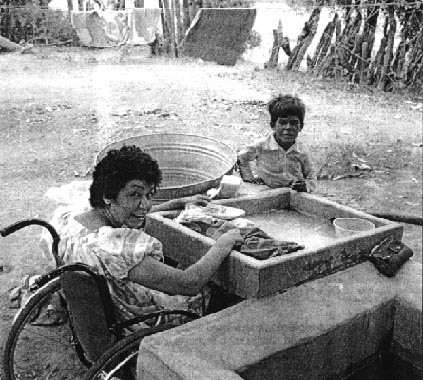 Chapter 22 shows how a man with cerebral palsy designed a non-spill carrying tray. Chapter 21 describes the creation of devices for straightening the back of a baby with spina bifida who had an extreme spinal curve. Chapter 23 looks at innovations that helped a man who had a stroke to relearn to talk and walk. In sum, Part 3 looks at a range of innovations to improve function and safeguard health, primarily for persons with complications of injuries to the brain or spinal cord. Often the concerned person plays a key role in the problem-solving process.